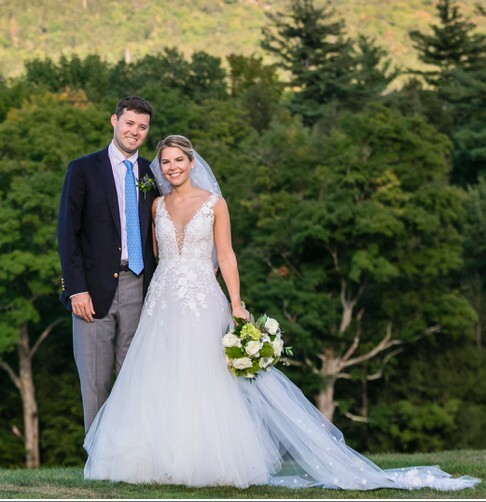 This gorgeous Mira Zwillinger Sophia gown was purchased at A Little Something White in Darien, CT. The top of the dress - V cut in the front and back - is created from a sheer panel of tulle with intricately placed floral lace that cascades down the bodice into layers of delicate tulle, making up the full A-line skirt. Clear sequins are scattered over top the lace, giving it a subtle and romantic glimmer in the night light. The dress is incredible in so many ways. I could move around effortlessly and comfortably without worrying about the top or straps falling down. It was PERFECT for dancing! It flowed beautifully - light and airy and not too full (to get in the way of anyone or anything). It is still in excellent condition - only worn once and dry cleaned immediately after. I am 5'6" 127lbs and wore 3 inch heels. My cup size is 34B and there are no cups or padding sewn into the dress.